Classic bedclothes in Zoo pattern. 1. Quiltcase: 120cm x 90cm - safely zipped, 100% cotton- certified. 2. Case for pillow: 60cm x 40cm - 100% cotton, safely zipped, certified. 3. Duvet: 60cm x 40cm – the outside is made of plain cotton, the filling is made of warm nonwoven fluffy fibre, antiallergic (cotton wool), the duvet is stitched, what prevents the filling from moving around. The duvet may be washed in a washing machine. 4. Pillow: 120cm x 90cm - the outside is made of white cotton, the filling is made of warm nonwoven, fluffy fibre, antiallergic (wool- cotton). 5. Protectors for rungs: 180cm x 20cm - prevent your baby from hitting side rungs. Since the protectors are not fixed to the bolster, they may be fixed in any possible way on the side of the bed. For instance they can be hung on one side, in this way you can watch your baby if you have your bed next to the cot. The inside is made of 2 cm poliurethane foam. Its thickness and stiffness prevent the baby from hitting. If you want to use your bolster for many years and keep its shape unchanged we recommend that you wash it with mild powder in temp. up to 30 degrees Celsius, in hands or using a special programme for gentle fibres. 6. Sheet: in white colour, with a sewn-in elastic band which prevents any movement of the mattress. 7. Cuddly: cute, rectangular pillow covered with colourful cotton and filled with silicon. 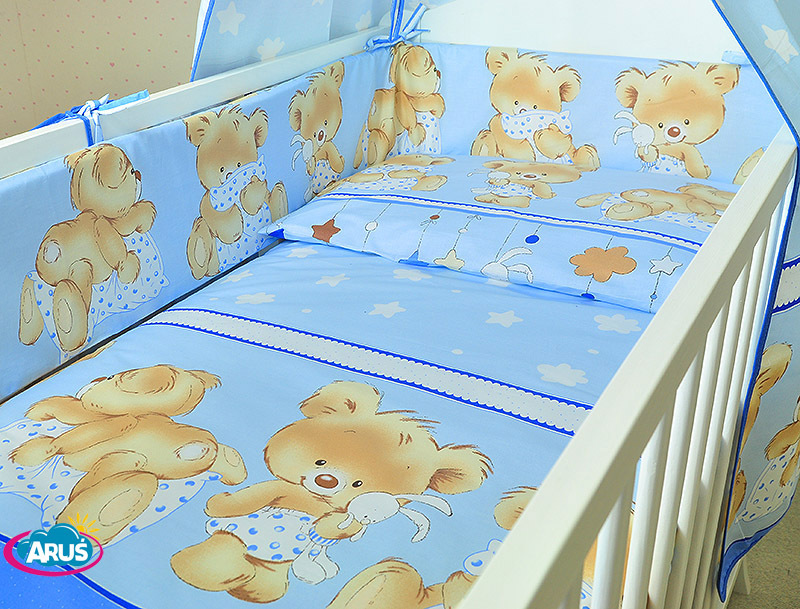 The set is BRAND NEW, straight from POLISH manufacturer – "ARUS BABY"